We’re still crunching numbers to put together the final breakdown post, but I thought I’d share a few observations in no particular order. All numbers are based on hanging weight (our butcher leaves the head on compared to the normal “hanging weight” definition). Our pigs yielded significantly more meat from their hanging weight than the half-pig we bought last year. For the same cut list, our pigs were 80% meat as compared to 65% meat last year. Our pigs were 8% bacon (down from 11% last year). Leaner pigs yield less bacon. The small pig was 7% bacon, and the large pig (the fatter one) was 9% bacon. I’ve had people ask me if you could just turn the whole pig into bacon. Sadly no. Bacon only comes from curing specific cuts of meat. In the U.S., most bacon comes from pork belly, although in many countries it is common to cure loins, fatback, shoulders, jowls, hocks, and other cuts as bacon. One advantage of home butchering would be that you could cure a lot more bacon from less common cuts. If you have pork chops cut from the carcass then you won’t get tenderloin or baby back ribs. This surprised me initially, but it makes sense when you think about it: each pork chop is effectively a section of spine and rib and a slice of the tenderloin / loin roast. We asked for the heart and liver back. Not sure what we are going to cook with these yet. I may have to trick Robin into eating them. We asked for the bones back. The whole small pig (from which we did not have pork chops cut) yielded 8.5 lbs of bones. I plan to make Tonkotsu Ramen soup with them. I wish I’d saved the trotters during butchering. We sold half of the large pig to a relative at cost, which worked out to $1.21/lb hanging weight (plus butcher costs). The cheapest I’ve seen it on Craigslist is $1.65/lb, so I think we did fairly well. One and a half pigs (270 lbs of meat) completely filled our 9 cubic foot chest freezer. 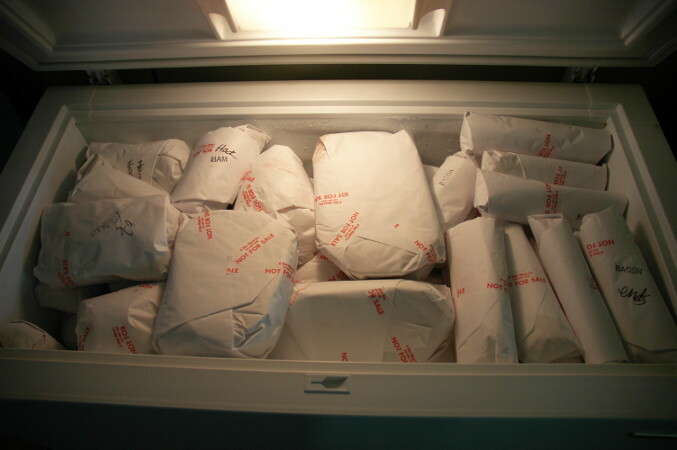 That freezer full of meat is a beautiful thing. We always butchered a steer each year, and our cousins a hog, and we’d trade half for half. Our deep freezer would look like yous, then slowly dwindle as we gave meat out to grandparents and aunts and uncles. There would be too much for just out family. And one year, we put over 50 chickens in the freezer. One thing about living on a farm – you eat very well. Congratulations! Sorry about the bacon screw-up. Good luck next year! Wow, I think your cousins got an especially good deal. There’s a lot of meat in a half steer! We certainly have the potential to eat very well. In practice, lacking an oven, sometimes it’s hard to use it all. I do enjoy never having to buy meat at the store. I cured some jowls… but they were too fatty for my taste. I’m amazed at the amount of fat… your pigs looked about like our first ones, and ours had a lot more fat than that. I wonder if they save it for making venison or other sausage. It is interesting, all the various cuts of meat from the same hog. Next time, we’re doing two hams, bacon, chops, and the rest as sausage. Thanks for the info on the jowls. I wonder if they’d be good for pancetta. The stuff you buy at the store can be awfully fatty. I don’t know what became of the fat. I was going to ask about it when I went back for the cured stuff, but with the bustle of them at first not being able to find my order it was forgotten. I haven’t opened the few packages we did get (last time we got a huge plastic bag of trimmings), but I’m wondering if perhaps they only saved the leaf lard or a few slab cuts. If I was butchering a pig myself, I would definitely keep it simple: bacon, ham, roasts, ribs, and sausage. The freezer is lovely. I envy you that! Were you disappointed about so little fat? I’d be hoping for lots to make lard. Did you take the head too? I’ve been reading about how to make head cheese. Not sure about that one, but it’s supposed to be tasty. We made head cheese one year. It’s a lot of work to skin and clean the head, in my opinion. The final product tasted a lot like braunsweiger (sp?) the way we made it. It tasted really good on the first sandwich. After that… not so much. It sat in the freezer for a long time before I finally fed it to the chickens, who liked it a lot more than I did. Next time, depending on how we feel, we might skin the head and boil, but then remove the meat to use in soups rather than make head cheese with it. That way it doesn’t go to waste. Ron, I appreciate that. Like so many things, head cheese might be an acquired taste. I do like your idea of using the meat scraps and stock for soup. Makes more sense, but I agree, nothing really goes to waste. Yes, we were very disappointed in the small amount of fat. I was expecting around 30 lbs instead of 8 lbs. I had plans for some lard candles, possibly soap making, etc. We had a neighbor tell us how much they like head cheese, and we got the name of a delicatessen in Portland that sells it. I’d like to give it a try before committing to the effort (and ick factor). If your butcher is stealing your fat, why wouldn’t he/she steal a little bacon too? What did they say when you raised the discrepancies? Perhaps the good fat was just ground into the rest of your sausage. No excuse on the bacon getting the wrong cure, though. Theft or not, it sounds like you need a new butcher. Well, they are pretty much the only decent mobile butcher option in our area. I’ve never heard of them messing up an order, but it will definitely weigh strongly on my decision next time as to whether we’ll handle the butchering ourselves or not. I suppose the fat might have gone into the sausage, but I’ve a ordered a mostly-sausage pig breakdown from them before and still got 11 lbs of fat from a half pig. I just took over from my dad’s business he breeded pigs and sell them to a processor to freeze them so I am curious about how much would one pig cost for the hanging stage and how much must it weight?